It gets everywhere. On my sofa. On my floor. Collecting in balls and rolling around. On my coat. On my socks. It also means I have to sweep the floor everyday. And don’t even mention that time one found it’s way into my dinner. I’m talking about dog hair. The bane of many owners lives. One of the main reasons I didn’t even consider getting a breed of dog with long hair. I remember my mum in despair as my childhood companion Golden Retriever would leave half his coat against the fabric sofa when he got up. And I had to brush him, a lot! Dobermanns have lovely short hair, but don’t be fooled. It moults just as much as any other dog. There is brief respite in the summer months, when it is thin and glossy. But in Autumn it’s back with a vengeance. No amount of sweeping, hovering mopping or cursing can stop it. You’ll clean, the dog simply walks through the room, and there’s a trail of hair. Argghhh. The very worst place for those pesky hairs (apart from your dinner) is your car seats. If you’ve ever put your dog on the back seat in a rush and thought, oh how bad can it be without a towel there, just this once. YOU FOOL. If you could go back in time to that moment, you’d have a good word with yourself and go get that towel. Because the hovering of those car seats after a few hour journey will be painful. And your seats are never the same again. Even the towel isn’t a great solution as it loves to hold onto those hairs and spread them around again. Which brings me nicely to an absolute essential product. Now we have a bigger car we put Lupo in the boot, which is protected by a boot cover. That holds all those pesky hairs and god knows what else, contained and easily cleaned. But having been that person with the big dog and back seat scenario, I thought it best to share where you should spend your money. So forget those organic dog treats for a few months, and get one of these. 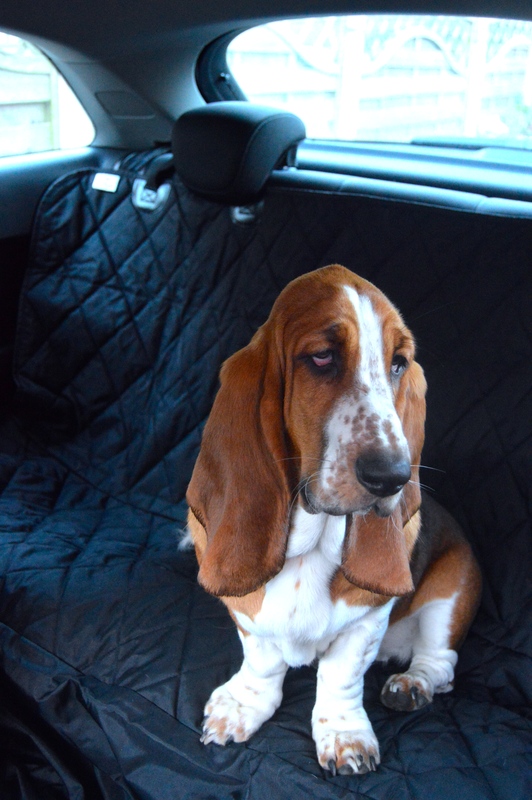 My friend’s gorgeous Basset hound, Edna, is modelling this back seat car cover from 4Knines. For £59.99 and free delivery, you’ll get a handy cover that fits perfectly in any car. It is tied into place and has a non slip back in case you have posh leather seats. 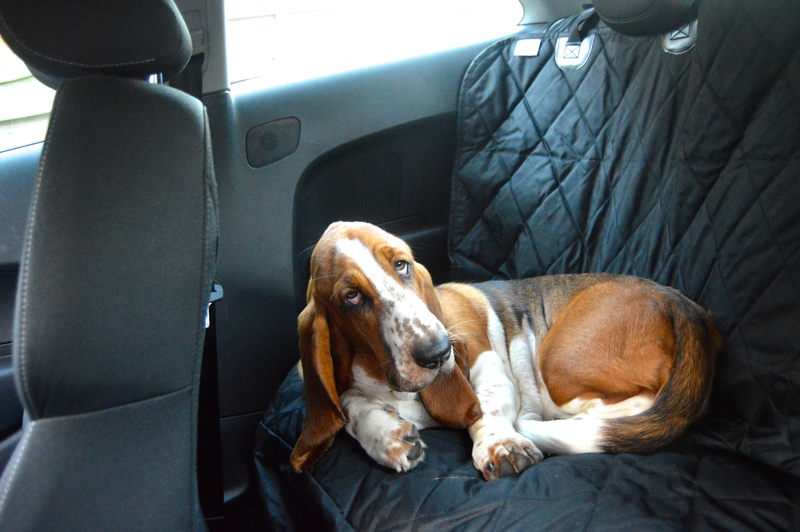 Now Edna is about ready to take 40 winks on that car seat cover so we can safely say comfort is not an issue. The only tricky part my friend came across was there were straps to fasten the cover down between the seat and the back, but her car seats are joined together. Not a big issue, but one to be aware of. It still does the job perfectly. 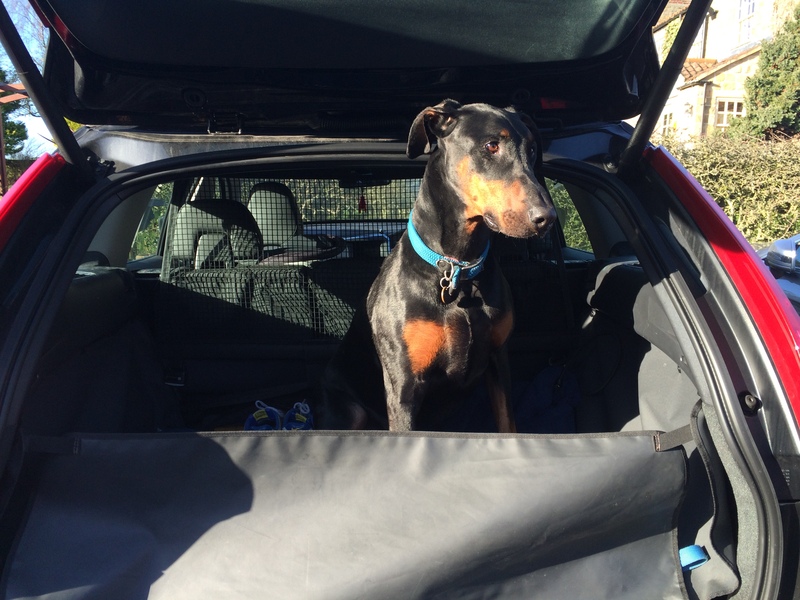 The folks at 4Kines also sell the boot covers and covers for the front seat if your pooch likes to ride shot gun. You can watch handy videos teaching you how best to fit the products on their site here. If you’ve fallen in love with Edna, and who wouldn’t? Follow her adventures on Instagram and her blog. Thanks for reading. Fancy posts like this direct to your inbox? Just sign up on the right hand side of the homepage.